ISBN: 9781782978404 | Published by: Oxbow Books | Year of Publication: 2015 | Language: English	210p, H242 x W170 (mm) colour and b/w illus. Eleven papers extend discussion of the role and importance of the landscape and the wider environment to past societies, and to the understanding and interpretation of their material remains, into consideration of the significance of the celestial environment: the skyscape. The role of the sky for past societies has been relegated to the fringes of archaeological discourse. 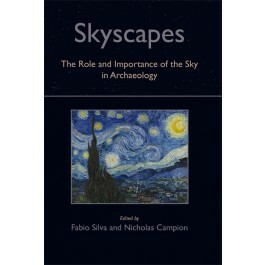 Nevertheless archaeoastronomy has developed a new rigour in the last few decades and the evidence suggests that it can provide insights into the beliefs, practices and cosmologies of past societies.Skyscapes explores the current role of archaeoastronomical knowledge in archaeological discourse and how to integrate the two. It shows how it is not only possible but even desirable to look at the skyscape to shed further light on human societies. This is achieved by first exploring the historical relationship between archaeoastronomy and academia in general, and with archaeology in particular. The volume continues by presenting case-studies that either demonstrate how archaeoastronomical methodologies can add to our current understanding of past societies, their structures and beliefs, or how integrated approaches can raise new questions and even revolutionise current views of the past. "Skyscapes seems to foresee new ways for development in the field that ought to be useful to any potential readers, notably archaeologists."